Yup, I'm one of the 365 ladies that will be representing Freshlook Illuminate as brand ambassadors. 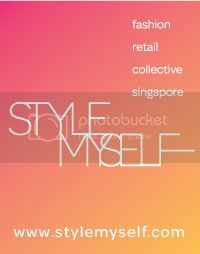 I was invited to have a mini makeover and photo-shoot session with them at the Plaza Singapura Atrium last Sunday. Like most of the ladies out there, I wear iris-enhancer contact lenses because they open up the eyes and make them look bigger. 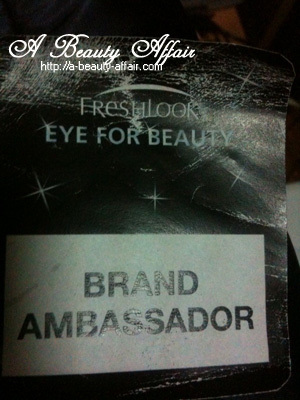 That's my eyes below with the Freshlook Illuminate contact lenses. Most will know that I am a fan of really big, dolly pretty eyes and such contact lenses help to achieve this look. The Japanese, Taiwanese babes & even Lady Gaga use such lenses to get eyes looking all big and anime-looking. Freshlook Illuminate lenses are iris-enhancer dailies so they are more hygienic and hassle-free. Just wear them and dispose at the end of the day :) The change was noticeable because my guy was like "Woah, how come your iris are bigger? I wanna try these lenses too" :P LMAO! I'll be looking forward to my photo and hope that I do not appear fat in there. I know I'm rather phototragic but I really do hope for a decent-looking shot. The makeup artist told me that I had good skin, that really made my day too! I was at Plaza Sing when you were giving your testimonial. But I was standing at a distance so I can't be sure if it were you :p So, it was!